When God finished creating the Earth, he found that he had piles of red, pink, white, brown, and gray rock leftover. Rather than discard this unorganized rock, he decided to create a work of art. He first laid down one color and then another until it was all used up. He then carved intricate canyons with streams, added splotches of green, and placed his masterpiece within a desert setting. When he finished, he looked over his workmanship and saw that it was good. Thus was born the Grand Staircase - Escalante National Monument. Calf Creek lies between Escalante and Boulder City, Utah and is a part of the Grand Staircase - Escalante National Monument. 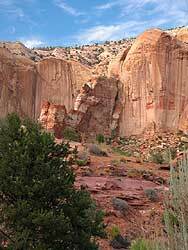 Calf Creek received its name from Pioneers who used the canyon as a natural stock pen where calves were weaned. The 5.5 mile round trip hike passes through beautiful Navajo sandstone canyons decorated with layers of color and dark vertical streaks left by rain water running over the canyon walls. These canyons date back to the Jurassic period when great desert sand dunes covered the region. The hike to the 126-foot-high Lower Calf Creek Falls changes very little in elevation, but the walk can be strenuous due to the sandy trail and the hot summer weather. 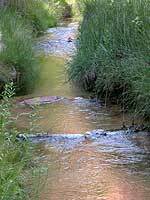 The trail follows the clear Calf Creek stream, which runs year long from its headwaters some 7 miles north. Once at the falls, mist and shade provided by the canyon combine to keep temperatures cool and comfortable even during the hottest of days. This cool haven includes a pool at the base of the falls, so inviting after a hot hike, that most cannot resist wading and swimming before turning back. The falls and surrounding area are decorated by hanging gardens and magnificent growths of moss, ferns, watercress and a rich variety of plants. The Calf Creek Falls trail travels through the wonders of nature. 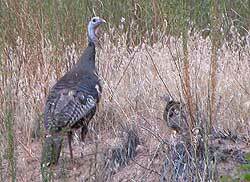 The hiker passes ponds and marshy areas (riparian areas) formed by beaver dams across Calf Creek. These dams help control spring flooding, reduce siltation downstream, and provide habitat for mature fish. Riparian areas are one of the most productive and important types of ecosystems. These areas display a greater diversity of plant and animal life than adjoining ecosystems. A healthy riparian zone filters and purifies water passing through it, reduces sediment loads, enhances soil stability, and contributes to groundwater recharge and flow. Life abounds within the canyon walls. As one stops to listen, many animal sounds can be heard. Birds in the area include the common crow, downy woodpecker, golden eagle, hummingbird, western bluebird, mourning dove, and wild turkey. Deer are frequently seen as well as, porcupines, beavers, lizards, snakes, and many other animals. 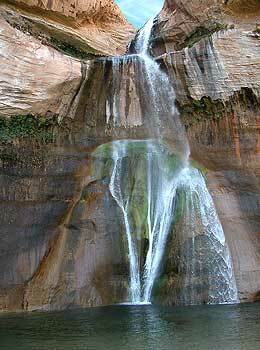 The Upper Falls, located farther upstream, can be reached only by a difficult one-mile hike over sandstone slickrock from the Escalante-Boulder State Highway 12, 5-1/2 miles north of the campground. The highway was constructed by the Conservation Corps (CCCs) in 1938. Until then, mail and supplies were carried to Boulder by mules and pack horses over Hell's Backbone Road or the Boulder Mail Tail, both hazardous routes. Boulder is said to be the last town in the United States to have mule train mail delivery.